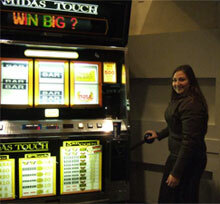 Big Bertha is an extremely popular slot machine that is prominent for its design, playing mechanism and payout system. This kind of machine was too expensive in production ($150,000 for complete manufacturing), so it was not available for all the people who wanted to use it. Later on it was transformed into Super Big Bertha. The machine had 5 horsepower motor with 8 reels and 20 symbols on every single reel. This machine had more than 25 billion variants. Big Bertha machines were mostly located in Las Vegas casinos because of being extremely expensive. As a result, the casinos were capable to make a nice profit. It may sound strange but the players could hardly win and also they were not able to back their money. In spite of the fact that it was really difficult to become a winner, there were some lucky players who managed to succeed. In the course of time a new version of this machine Super Big Bertha was introduced. It had 8 reels and 160 symbols. These symbols gave high payouts. The new type was also pretty popular and had many fans that were ready to play day and night. Super Big Bertha definitely was a great machine, but it wasn't very attractive for the players. This payout percentage to players of this machine was 80%. The chance to win a jackpot was 1 in 25.6 billion. But later on computer RNG (Random Number Generator) was invented. As a result, Big Bertha slots started disappearing. The new version was not so big and it did not require so much money for its production. This new version randomly chose winning numbers which were related to symbols that appeared on the screen. It is said that all video slots were generated by the introduction and further transformation of RNG slots. RNG machines are the slots programmed to generate a higher number of stops and symbols. So, we may see the introduction of Big Bertha was a milestone in the history of all further slots development. Thus, today we can enjoy playing all possible slots descendants.